The Premier League Writing Stars competition last year encouraged more than 25,000 poems on resilience to be written by primary schoolchildren across England and Wales. "Football Mad!" was the poem submitted by William Quinn, from Netherton Infant School, in Huddersfield, inspired by his local Premier League club, Huddersfield Town. "William has always been an avid reader but not so much a writer," says his mum Sarah. "Huddersfield Town means a lot to William. Every morning he reads the programmes he has collected as a season-ticket holder. "But Premier League Writing Stars really inspired him and his whole class to write. "The chance to write a poem that they may read was a huge incentive for William." The inspiration was such that William's poem won a regional award. "When the news broke that his entry had been successful his confidence in his writing ability soared and he produced much more, higher-quality writing," Sarah says. "He now believes he can do it and do it well. "William loves to read but he now also loves to write. We are so happy that we got to experience this. "As a teacher too, anything that can encourage children to write, especially boys, is a very admirable thing to do." 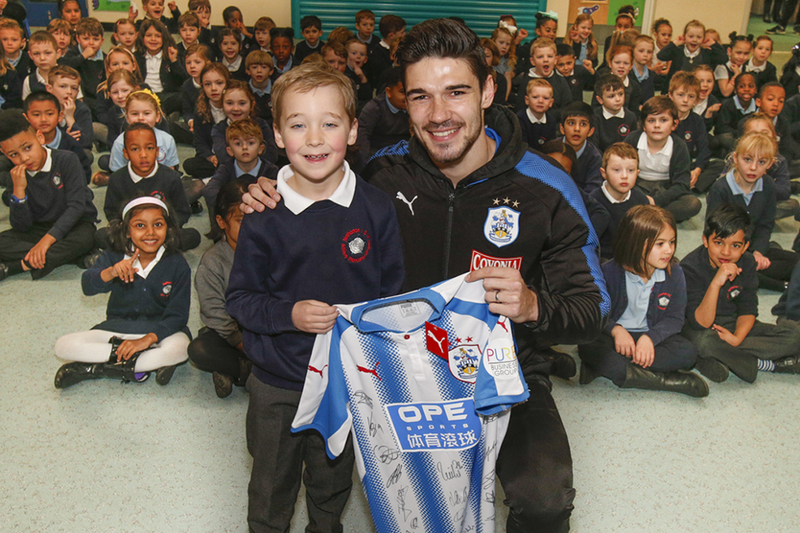 For his award, William received a framed copy of his poem as well as a signed Huddersfield Town shirt and a visit by Terriers defender Christopher Schindler to his school. "Christopher Schindler arriving at William's school and reading his poem out was priceless. Memories that will last a lifetime were made. "Huddersfield Town are such a special club. The role they play in our town is fabulous; the way that everyone responded to William was amazing." Thousands more children will be inspired like William when the Premier League Writing Stars competition returns for 2018.